New Brooklyn, follows the adventures of a unique group of heroes who emerge in the fallout from a sentient Brooklyn’s decision to physically secede from New York State. The New Brooklyn universe debuted earlier this year with the first title, The Red Hook by Eisner-Nominee Dean Haspiel, and was followed by The Purple Heart by Vito Delsante, Dean Haspiel, and Ricardo Venâncio. Available now, The Brooklynite follows Brooklyn cartoonist Jake Jeffries, who gets caught in the fallout of a super-human battle and is irradiated with superpowers. Fraught with “Superman powers and Spider-Man problems,” Jake learns to fight crime in his secret identity as The Brooklynite, and chronicles his adventures in a comic book series while struggling to lead a dual existence. 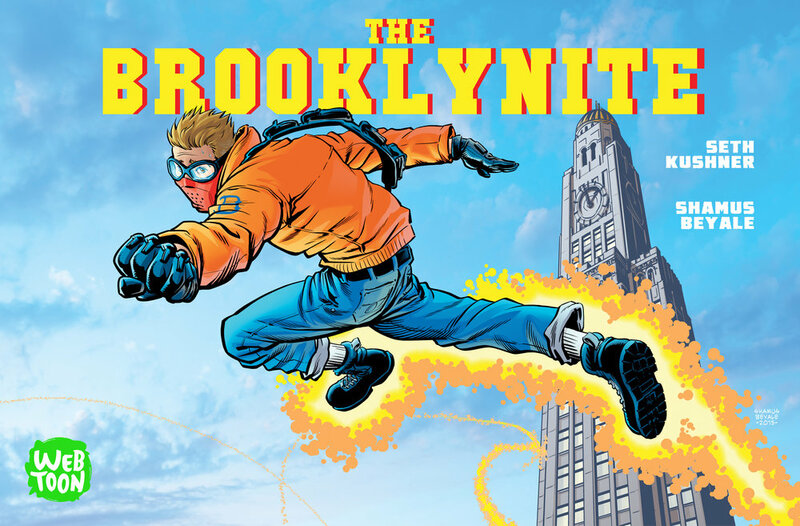 The Brooklynite was co-created by Seth Kushner, an award-winning Brooklyn-born photographer and comic artist. Kushner passed away last year following a long battle with cancer and The Brooklynite is his last published superhero work, created in partnership with artist Shamus Beyale. War Cry is a spin-off title to the critical hit The Red Hook. It will draw readers back into the Red Hook’s adventure with the surprising return of another familiar face. Written and illustrated by Dean Haspiel, War Cry takes readers into the aftermath of the alien attack on earth that killed most of America's superheroes. Now an orphaned, teenager named Rajak has mysteriously become the recipient of all of the dead superheroes powers and escaped to New Brooklyn. When he shouts the words “War Cry,” Rajak transforms into the perfect war goddess, who is a cosmic resurrection of Ava Blume, formerly known as The Possum and love interest of superhero The Red Hook. "War Cry is complex; Romeo versus Juliet but with superpowers,” said creator Dean Haspiel. “I'm thrilled to see the New Brooklyn universe develop as the character’s story lines start to cross over." The Brooklynite is part LINE Webtoon’s first-ever official Launch Week – a designated week each month that will bring readers a fresh new comic title five days in a row. This first lineup includes drama comic Big Jo by Jungle Julia on Monday, comedy comic Adventures of God by Kasper and Teo on Tuesday, superhero adventure The Brooklynite, and fantasy comics Mirror by renowned artist Karl Altstaetter on Thursday and Athena Complex by Kaisar on Friday. Beginning in January 2017, readers will be able to look forward to the launch of five consecutive new titles every month. Fans can dive into the New Brooklyn’s The Brooklynite today and every Wednesday here [add direct link]. To download the official LINE Webtoon app, visit the Apple App Store and Google Play.